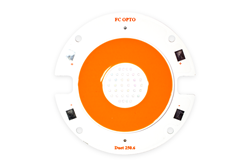 Flip Chip Opto introduces 100, 200, 300 watt Flip Chip LED COBs to the horticultural industry. Duet 250.6 - with a ratio of 1 to 6 shows an incredible PPFD output of 279. Flip Chip Opto introduces mid-power solutions to the horticultural industry. The Duet F series comprises of 100, 150, 200, 250, and 300 watt versions of the Flip Chip LED COB. Offering 5 different PPFD ratios between 450nm royal blue and 600nm-700nm broadband red, the different PPFD ratios under the dedicated spectrums allows unparalleled photosynthesis and corresponds to the various plant growth stages. Each COB is structured based on the patented DBR LED Flip Chip and uses Flip Chip Opto’s in house LTBT (low temperature bonding technologies) which boosts lighting efficacy and decreases the thermal resistance between the LED chip junction and the module’s metal substrate. The Duet series features 1/3, 1/6, 1/8, 1/10, and 1/12 ratios in blue and red power consumptions. The PPFD outputs in various ratios allow horticultural applications that focus on different stages of the plant life as photosynthetic absorption rates vary throughout the life cycle. The 3 selections of red peak spectrums of 627nm, 640nm, 650nm enable growers to choose their preferred broadband. Additionally, it can be substituted in spectrums ranging from 2700K – 5700K CCT and 60-98 CRI.